With the original lineup together after an eight-year hiatus, and coming off of an incredible performance at Rock On The Range last weekend, LIVE has been added to the Rocklahoma lineup for Saturday, May 27. LIVE will be stepping in for SOUNDGARDEN, who are unable to perform due to Chris Cornell’s untimely passing. Following LIVE’s performance, there will be a brief tribute to Chris Cornell. 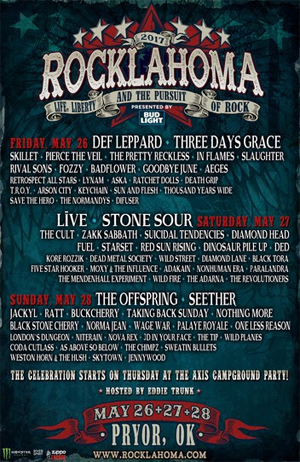 For the current Rocklahoma band performance times, please visit www.Rocklahoma.com. “It’s been a challenging week for everyone, as Chris Cornell was such a meaningful individual and artist to us. But our belief is he would want us to move forward. We are truly honored to have LIVE join the Rocklahoma lineup for the very first time, and appreciate the band making themselves available for this unexpected performance,” commented Joe Litvag of AEG Presents, executive producer of Rocklahoma.